Amazon announced today it plans to start offering its new version of the Fire HD 8 and dropping the price, while adding Alexa as a virtual assistant to play your music, start your games, or read audiobooks, according to a story on pcmag.com. The introduction of the new 8-inch tablet offers a longer battery life, twice as much on-board storage, and 50 percent more RAM, making the operating system run even faster than last year’s HD 8. The company says the new 4,750 mAh battery will provide up to 12 hours of mixed use. And to top it all off, Amazon announced the new version will start at $89.99, quite a drop from the previous version’s $149.99 price tag. The new tablet will feature the Fire OS 5 system, with an 8-inch, 1280 x 800 HD display with over a million pixels, and a 1.3GHz quad-core processor. The new devices will have 1.5 GB of RAM, with a 2 MP rear-facing camera, and a VGA front camera, and can be purchased with either 16 or 32 GB of storage, up from last year’s 8 and 16B models. It also features a microSD slot which can receive cards of up to 200 GB for additional storage capacity. 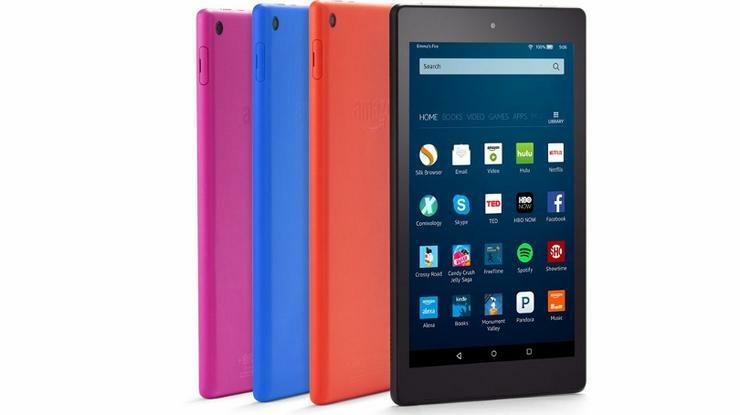 The company is also making the Alexa software available on its Fire HD 10 and Fire models, and plans to roll out a free over-the-air update, including Alexa, to last year’s Fire HD 8 tablets within the coming months, according to the article. This is the first time the company has offered the voice service in its line of tablets. The new tablets are available for pre-order, and can be purchased in four color options, black, magenta, blue and tangerine. Shipment of the new devices is planned to begin on September 21.